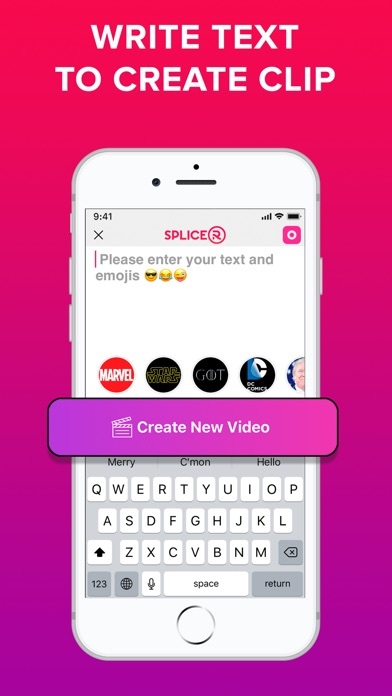 Welcome Splicer Video MEME maker and forget about your ordinary emoji & gif keyboards and old-school stickers! Turn text and emojis to funny videos, share with friends and have fun chatting. Chat with LOL video jokes made of popular movies and youtube videos. Wanna try? 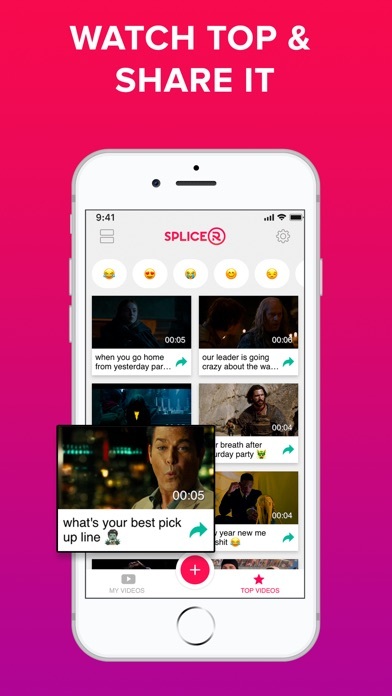 :) Splicer Video MEME maker is a creative video maker - video mixer & video merger for a chat. Here is a new funny alternative to boring emoji keyboards and gif keyboards. If ever tried fmm - funny video makers - and you are a fan of live chat rooms like whatsapp, chat roulette, holla or omegle - you are sure to like Splicer and the way it joins videos into funny collages. 1. Add text & emoji to the keypad 2. Splicer will combine & merge film scenes into video jokes 3. Save and send in a message 4. 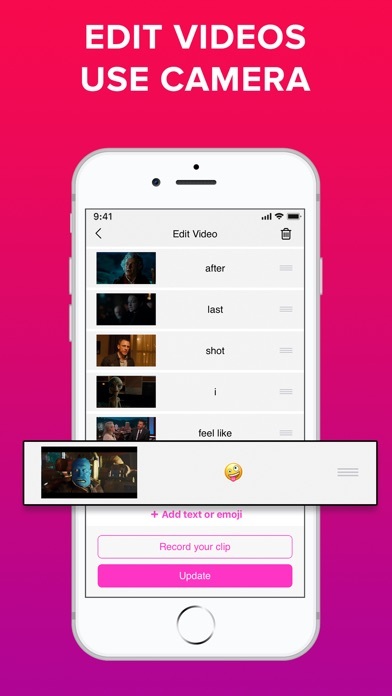 Have fun chatting live with your friends in a messenger FEATURES: • Convert text to video • Convert emojis to lol video • Combine text + emojis and convert them to video If you are bored with ordinary gifs, emojis & stickers, Splicer Clipper + Keyboard is a quick and easy to create unique video messages and even video stories. Funny jokes, sarcasm, horror - create all kinds of video collages! Express your creativity and surprise your friends. 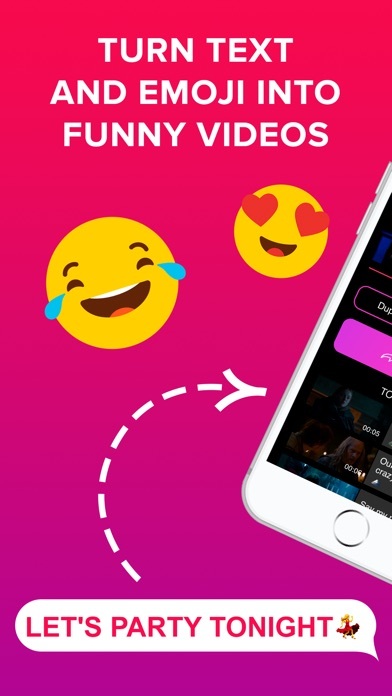 Let the fun begin :) ***************** Premium access: With Premium access you get unlimited access to all the features Splicer Funny Video MEME Maker has in stock. 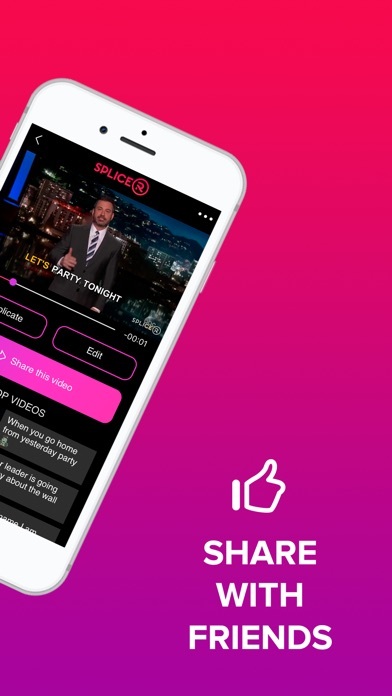 Pro Upgrade Features • Unlimited edit of your videos for better fun • Unlimited use of camera to make funny clips • Save your content in our cloud • Unlimited splices forever Information about the auto-renewal of subscription: Subscription price starts at 1 week ($8.99 USD) with a 3-days free trial period and 1 month ($19.99 USD). The exact cost may vary depending on your location. - Subscription automatically renews unless auto-renew is turned off at least 24-hours before the end of the current period. - Subscriptions may be managed by the user and auto-renewal may be turned off by going to the user's Account Settings after purchase. - Payment will be charged to iTunes Account at confirmation of purchase. Very interesting app. And so easy in use. Very beautiful design! Thanks to creators!! I do use this app on my phone and i do really like it, it makes me look more joy and smiling. Love It!!! I really like the app and that it is so nice. I would recommend this to anyone who likes joking. I love it. Fun and Cool and Witty, but I do wish some new movies.But overall 5stars.